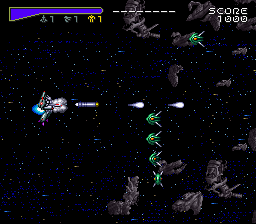 Choujikuu Yousai Macross Scrambled Valkyrie is a horizontal shooter by Winky Soft/Zamuse based on the popular animation series of the same name. In the future, humanity is engaged in a war against giant humanoid aliens called the Zentraedi after one of their spaceship accidentally crashes on Earth. The game follows the popular Macross formula and features giant transformable fighter-jets. Each one of the three selectable characters (Hikaru, Max and Milia) comes with his own tactical fighter capable of changing into three attack modes :Fighter, Gerwalk and Battroid. Each Veritech comes equipped with a specific weapon system ranging from standard Vulcan guns to homing shots, laser-shields or wave-beams. These weapons are upgraded by collecting multiple "P" pods that float throughout the game. Each attack form upgrades separately up to a maximum of three times and a direct hit automatically downgrades the current active weapons. Although the player can switch from one attack form to another at will, they feature different speeds and maneuverability characteristics. They also all share a special weapon called the Mingmei cannon - a special force field wraps around the Veritech when weapons are idle a fews seconds. When in this mode, the fighter can capture standard enemies ships and use them as shields or as secondary weapon/ally. Released on October 29, 1993 in Japan for 8800 Yen.